This adorable cafe style table and chairs set is brightly colored which adds a unique artistic style to your garden. Light weight, heavy constructed and easy to clean. All the pieces are easy to setup and fold for storage. Perfect for indoor or outdoor activities. 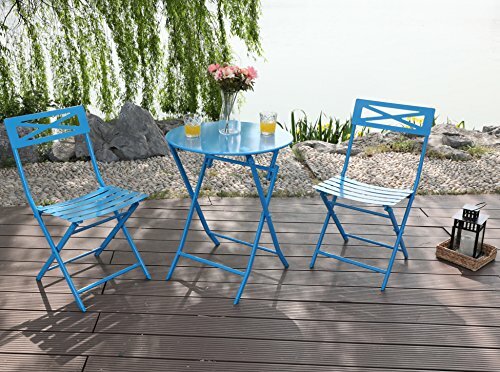 This bistro set will make a lovely relaxing enviroment where you can catch up with friends or family over coffee. Chair Size: W19.6" x L16.5" x H31.9", Table Size: Dia23.6" x H28"
CAPTIVA DESIGN is a designer's brand and manufacturer which indicates to provide high quality leisure garden furniture in order to meet the continuously expanding market. CAPTIVA DESIGN produces a specific range of garden furniture which includes chair, patio umbrella, furniture set etc. High quality and fashionable design is CAPTIVA DESIGN first goal. Customer's satisfaction is CAPTIVA DESIGN first demand. By using special chosen design and color. CAPTIVA DESIGN product will provide you with gorgeous beauty of imagination and efforts. Table Size: Dia23.6" x H28" , Chair Size: W19.6" x L16.5" x H31.9"
View More In Bistro Sets. If you have any questions about this product by Captiva Designs, contact us by completing and submitting the form below. If you are looking for a specif part number, please include it with your message.